If you are tired of traditional pasta sauces, then you are in for a treat today. This Broccoli Feta Pasta Sauce Recipe is incredibly delicious and full of fresh flavor. It’s a great low calorie pasta sauce to top your favorite noodles. It also works great over chicken, rice or a baked potato. I first ate these over Miracle Noodles and it was excellent and very filling. 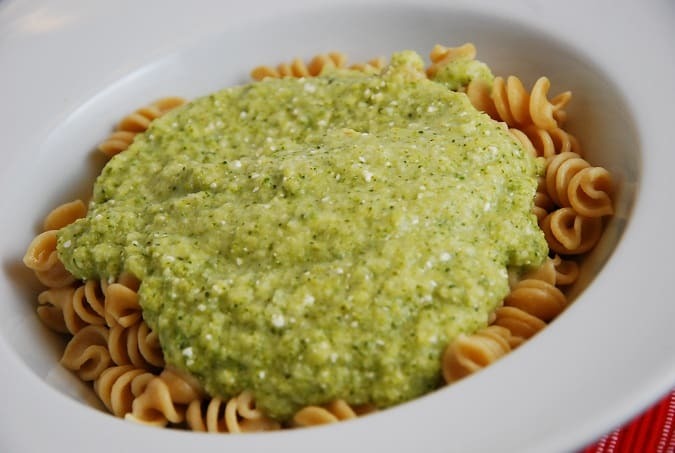 This decadent pasta sauce is a great way to get in your veggie servings, too, as the sauce is mostly broccoli. But surprisingly, it doesn’t have an overwhelming broccoli taste. The feta helps balance it out, delivering a perfectly flavored sauce that is nutritious as well as delicious. A delicious, creamy and silky sauce that works wonderfully over pasta or potatoes. It’s loaded with healthy broccoli and is a delightfully unique pasta sauce recipe that will help keep your Weight Watchers goals in check. Using microwave or vegetable steamer, steam broccoli until tender. In a large, nonstick skillet, melt butter over medium high heat. Add in onions and garlic and sauté for about 3-4 minutes or until onions begin to soften and become translucent. Transfer cooked onions and garlic to a blender. Add in the steamed broccoli, feta cheese, olive oil , lemon juice, water, and salt & pepper. Puree until smooth. Add additional water if sauce is too thick. Does this freeze well if I make a bog batch of it? This recipe is amazing. I add some basil in mine. Making it for the second time tomorrow. I have made this recipe a few times now. It is soooo good!! Thanks. This was wonderful!!!! Thanks for the recipe.